I was back in Patna for a vacation after a few years away, for my education – so my family was understandably thrilled about having me over after a long time. They suggested that we go on a trip somewhere, and renew the old tradition of the family summer vacations that we used to go on when I was young. I looked up a few places which were close by, and Aurangabad was the one that attracted me the most. Declared as the Tourism capital of Maharashtra by the Government in 2010, Aurangabad is definitely among the top tourist destinations in the area. So it was a no-brainer for us to take the decision to visit the place. However, being quite far away, we were looking for the best way to reach the city. With mom and dad being old, they were looking for a comfortable and economical option – cabs were the best option. We looked to book a safe and trusted cab service in Patna and were thrilled with the option we got. We planned a vacation with two days in Aurangabad, not counting the time for the drive – so the distance and the time that it takes to reach Aurangabad was not an issue. The drive is long, so we started early in the morning and the cab promptly arrived on time. After spending the whole day in the car, we finally halted around 7 in the evening and planned to start again in the morning the next day. By around ten in the morning the next day, we had reached the famous city of Aurangabad. The first thing that struck us was the energy that was prevalent in the city. Wherever you looked, there was hustle and bustle. This put us in the right mindset as we set about exploring the city. Having the cab at our disposal was extremely helpful, as we planned to visit a lot of places over the two days. The Bibi Ka Maqbara was the first site that we visited. The landscapes and the gardens in the place were extremely beautiful, and we were blown away by the beauty of the stunning Mughal architecture. Lunch from the site, in the local Mughlai way of cooking, was one to remember too. After that, we moved on the Panchakki, which was a flour mill which was built during the times of the Mughal emperors to prepare the food for the devotees. The importance of the rich history in the place was not lost on us – it was extremely pleasant on the eyes, too. After a tiring day exploring the Mughal architecture and these two sites, we were understandably famished – and we simply had to visit the famed Gul Mandi for some sizzling kebabs. The markets in the area were great too, and we set about exploring both Gul Mandi and Connaught Market on food, hogging on street food which mainly comprised of some great tandoori delights. After that, we retired to the hotels for some well-earned rest. 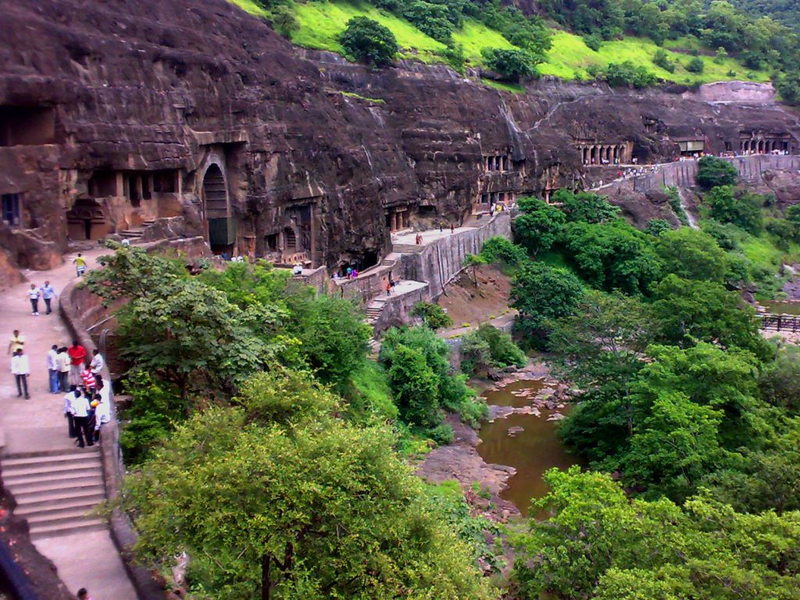 The next day, we similarly set out early in the morning to go to the world-famous Ajanta and Ellora caves. The caves have some brilliant paintings and sculptures, which are a delight for anyone exploring them. The murals themselves deserve a lot of attention, and take a lot of time to be explored – they can be a fulfilling experience. My parents had a fun time, as they are both history buffs in their own right. We had food from a restaurant near the Ajanta caves and finally returned back to Aurangabad after having some amazing experiences. There are a number of cabs to Aurangabad which anyone can book online. We chose Savaari as it offers many positive features: one can choose cabs/taxis that range from 4-seaters to 6-7 seaters according to the group size. They follow a transparent billing system, with zero cancellation fees. Courteous chauffeurs, who are road trip experts along with a clean car are the added benefits. If one plans to avail a car rental service in Patna then booking a trusted service is better. The drive can be quite long, and it can last 20 to 24 hours depending on the traffic and the speed you drive in. This is a guest post by Vijay who loves travelling with family and explore places of historic importance. This post definitely makes me rethink about visiting Aurangabad and seeing these historical places and enjoying the wonders of the city! We also try to go to a trip every time we come to India. Aurangabad seems really nice and I have not been there before. Adding this to my travel wishlist now. I am an avid traveler and one of the places I’ve not yet visited is Aurangabad. Historic places is my weakness. I have never been to Aurungabad. After reading your post I would love to visit there sometime. I love to read travel blogs n this is one is a great read. Thank you for sharing your experience in details. I am sure this will help travellers.